"My cat has difficulty using the litter tray!" ALL THE ITEMS LISTED ON THIS PAGE ARE SUGGESTIONS ONLY. If you suspect that your animal has a health problem, it is essential to see your vet first, .e.g. a gait problem may be related to back pain, etc. I also recommend contacting a Tellington TTouch Practitioner, or Practitioner-in-training to discuss further solutions and to learn a technique that will only help further. 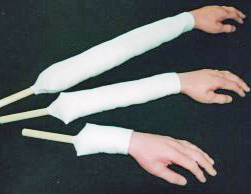 The equipment has all been inspired by TTouch and works best when used in conjunction with the technique. Book a session or workshop – you may be surprised! When doing anything with your animal, it is important to remain COOL, CALM and CONSISTENT – our dogs look to us as role models. If we are getting hysterical, then they will really believe there is something to worry about. This is particularly true of vocal animals. Show them how you want them to be. 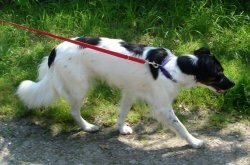 This is very common problem, and one that can easily be rectified with a little patience and the right technique / equipment for your dog. I hear of many 'obedience' trained dogs that walk to heel beautifully at training, but as soon as they are outside or you don’t have treats in your pocket they’re off! Most dogs pull because you follow. It doesn’t mean that they enjoy it – bulging eyes, choking, neck pain, yelling owner – what’s to enjoy? It’s just habit, so we need to find a gentle way to change the habit. Look at a double-ended lead. This uses a simple technique that suits many dogs. The Mekuti Balance Harness is a patent pending design that enables you to ask your dog to balance without relying on you. It comes in 5 fully-adjustable sizes to ensure a comfortable fit and feedback is very positive. There are some situations with your dog which are potentially stressful and a quick and easy way to attend to them is by doing TTouch Earwork. Constipated, or suffering from diarrhoea. Keep yourself safe at all times. Use your common sense about approaching a dog unknown to you. If you are dealing with a fearful dog, consider using an Assessor Hand to start the earwork until you are confident they are feeling relaxed and comfortable with physical contact. TTouch Earwork is a 'normaliser' and will help to rebalance the condition. Earwork can be one of the first ports of call when it comes to dealing with 'a situation'. 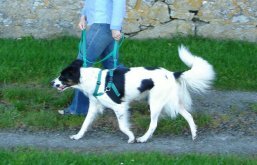 The technique is easy to learn, easy to administer and can very quickly help your companion animal (this technique works on all animals such as dogs, cats, rabbits, horses etc.). The ear is often easily accessible even in situations of trauma. The video shows the technique in detail but to summarise: start with some mindful strokes; then progress to 1 and a 1/4 clockwise TTouches using just enough pressure to move the skin with the end of your fingers to the forehead, muzzle, back of the head and neck. Use your other hand to support the chin in case your dog (as in the video) wants to relax move on to the base of the ear with the circles and then do some gentle slides with your fingers at the back and your thumb on the inside from the base to the very end feathery tips, taking particular attention over the very tip of the ear. At all times, it is important to remember to keep your own posture as relaxed as possible and most important: DON'T FORGET TO BREATHE! As a TTouch Practitioner, I have found that most inappropriate barking or chewing is down to tension in the mouth, jaw and head, and alarm “barking” from the dog’s guardian. The first step is to remain calm. If you’re shouting you are giving them justification for also shouting. 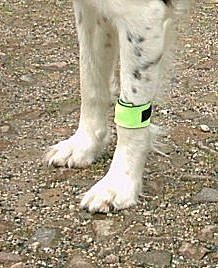 The Calming Band is a simple elasticated and webbing band that gently brings the dogs awareness to the fact that they are barking. Our systems are designed to create habits – most of them are useful (when did you last have to think about the stages required to put toothpaste on your toothbrush? ), some of them aren’t (my sister would always fill her glass 3 times from the tap before drinking the water). How many of you rub an ear when you’re feeling unsettled, or roll your wedding ring – do you even know what you do when you’re nervous? Most dogs have no idea that they are barking. By placing a Calming Band on your dog, they will be aware that their mouths are moving; the band is designed to touch the mouth and head, without restricting movement or holding the mouth closed. This interruption to the behaviour can be enough. Within the system of Tellington TTouch we use mouthwork with vocal animals, those that are off their food, hyperactive or are generally over-emotional. This mouthwork stimulates the limbic system – the part of the brain that governs the emotions. You see people who have had a fright, or won the lottery, place their hands over their mouths. It is an instinctive form of self-calming. The Calming Band works in the same way. If it doesn’t work, return it (undamaged) and get your money back. This can also apply if your dog is generally nervous or lacks confidence. A bumper sticker that I would love says, "Hugs, not drugs". It is known that a hug releases natural endorphins – feel-good chemicals that lower anxiety, help with pain-relief and allow you to cope with life better. I’d prefer a hug to medication any day! Dogs, however, can find our hugging them distressing. They need to know that they can flee if they need to. How would it be if you could give them a portable hug? You can. 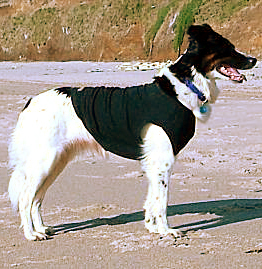 Using a Body wrap or T-shirt. Both of these give your dog a sense of their bodies, where their body ends and the world begins. Many people are sceptical about them to start, but very quickly see how their companion settles down. "My Stafford coped really well with the fireworks for the first time since I had him, he slept on the floor, only occasionally looking up for a big bang. I’d only ever known him to cower behind the sofa, and not come out for some time after the noise had stopped. I can now take him out for a wee!" An added benefit to the wrap and the degree of relaxation it brings is to reduce pain. One dog has had his Metacam dose cut in half for a trapped nerve. Another dog who suffers from seizures has dramatically reduced the number and duration of seizures, and the recovery time is down to 30 minutes. There are no signs of the usual exhaustion, and she wants to go out for exercise soon after an episode instead of resting for 24 hours. Trips to the vet can be far less traumatic, allowing your dog to feel calm, and learn to think about the whole experience, instead of thinking 'Vet bad'! Sue Williams from Coventry says, "My dogs enjoy wearing their wraps. They queue up and wait to have them put on! I’ve been telling everyone about Body Wraps – they’re marvellous!". The Body Wrap comes with a safety pin and full (simple) instructions. Some animals are born sensitive – they don’t have to have been abused or mistreated to behave the way that they do. It is easy to create stories to fit, but not actually very helpful. If they have been abused in the past, draw a line under it. Today is another day and the past has gone – it cannot be changed. Accept them as they are now, in this moment – it could well be different tomorrow, but all any of us want is to be accepted. We’re ok as we are. Using an Assessor Hand, you can keep a respectful distance from the animal, crouching to one side of them (never head on), keep your body sideways on to them (if it’s safe to do so), with your eyes lowered, place the back of the hand in front of them to let them sniff it. So much information is gathered from smelling things. If we are nervous about something, the chemicals produced by our bodies evaporate through our skin. A sensitive animal will pick this up quickly and their anxiety may increase. The Assessor Hand doesn’t give off this information, and remains neutral. Once they have sniffed it, they will hopefully look away from both you and the hand. If they don’t, you are possibly too close for their comfort. Take a step back, keeping your eyes lowered. When they are looking comfortable, again with the back of the hand, gently stroke down the shoulder closest to you ONCE. Let the hand rest on the ground. Give the animal a few moments to assimilate the information, then stroke down again. You can be trusted not to push them beyond their comfort zone. You understand what they are telling you. Gradually, you can start to stroke more areas close to the shoulder. Try moving the skin in one-and-a-quarter clockwise circles using the hand. Always return to the shoulder (assuming that they enjoy it). Be aware of your animals responses when being touched in different areas. A slight turn of the head is enough to say that there is sensitivity there – go back to an area where they are completely comfortable being touched. You need to acknowledge what they have said to you with this action. As the animal becomes more comfortable with being stroked with the back of the hand, turn it over to use the flat of the hand. Then you can start to move your hand up the handle and incorporate it with the touching (again starting with the back of the hand). Always take a session at their pace. 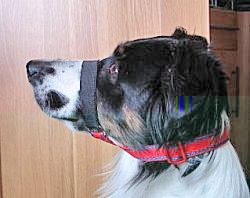 Keep yourself safe – muzzle a dog if necessary. A muzzle doesn’t stop the communication or mean that you can push them. It is just a means of keeping you both safe. Several 1 – 2 minute sessions spaced throughout the day is far more effective than one half hour session. If you are still having problems, contact a TTouch Practitioner. 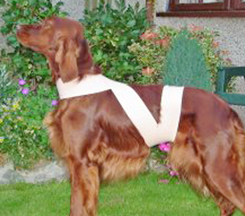 Leg wraps placed on 2 legs brings awareness to them, and allow the dog to reconnect with their limbs. Once this connection has been made, they are able to use them more efficiently – picking them up when dropping them, walking or running straight instead of sideways, etc. Again, leg wraps help to bring awareness to the legs and helps a cat to lift their legs getting in and out of the tray. You could also look at the litter itself. Some cats develop a dislike of the feel of some litters, so try different ones to see which is preferred. If you cat is urinating on cushions, soft furnishings or strange places, take them to a vet and just check that they don’t have cystitis. It is common for them to locate more comfortable areas to relieve themselves, thinking it will reduce the pain they feel when urinating. Ensure that the tray is located away from their food, and away from doors or windows where neighbouring cats can spook them. If your cat is feeling unsure or afraid, they are not going to use the tray! Try a covered tray, or uncovering a covered one. Everyone has personal preferences – our cats are no different!